We are Advanced Wildlife Management. We are a small family run business. Our owner, Chris, has been doing wildlife removal for around fifteen years. We believe that every customer deserves excellent customer service. We are a wildlife management company. 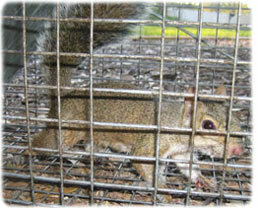 We remove pest animals from people�s homes, yards, barns, etc. 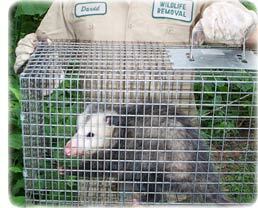 We remove wildlife from people�s homes, barns, yards, etc. We do so in an efficient and humane way. For instance, if a customer has raccoons in their attic, we will perform trapping services, and remove the animals per state guidelines. We also do repairs and preventative work. We repair the holes in which the animal entered the home, as well as handling any damages the animals may have done. We also install barriers around porches, patios, and decks to prevent animals from digging under them. We perform a thorough inspection for the property so that we know exactly how to handle the job. This inspection includes both outside and inside the home. If the home doesn�t have an attic hatch, we will install one for the customer. We do repair work for the customer. We repair the entry points that the wildlife has created. We do some light construction work and fabrication. We do attic clean-outs as well as insulation work. And, we provide the best customer service in the area. Advanced Wildlife is passionate about what we do. We are dedicated to providing the customer with the best possible experience they could have. There are many Lebanon pest control companies, but most deal with extermination of insects. We deal strictly with wild animals, such as raccoon, skunk, opossum, and more. Advanced Wildlife Management differs from the average Lebanon exterminator business because we are licensed and insured experts, and deal only with animals. We are not merely trappers, but full-services nuisance wildlife control operators, offering advanced solutions. Lebanon wildlife species include raccoons, opossums, squirrels, rats, skunks several species of snakes and bats, and more. Many animals can cause considerable damage to a house, not to mention contamination. We offer repairs of animal entry points and biohazard cleanup and we guarantee our work. Our Lebanon rodent (rat and mouse) control is superior to other pest management companies. All of our wildlife trapping is done in a humane manner. Of course, we are properly Ohio state licensed. We are highly experienced in Lebanon raccoon removal, squirrel removal, bat control, and more. We at Advanced Wildlife Management believe we are the best Lebanon trappers of wildlife, and would be happy to serve your Lebanon bat removal or pigeon and bird control needs with a professional solution. Skunks, moles, and other animals that can damage your lawn - we trap them all. Our professional pest management of wildlife and animals can solve all of your Lebanon critter removal needs. Our specialty is removal of animals in homes such as raccoons in the attic or squirrels in the attic. If you need Lebanon pigeon control, Canada geese or other bird removal, we can help. We are experts with skunk problems, digging animals such as armadillos, & groundhogs, and we offer Ohio dead animal removal. We trap mice and voles. We do home repairs, animal prevention, and removal of critters from the attic, ceiling, basement, animal in the wall, and any part of a building. Give us a call at 513-298-5400 for a price quote and more information. Remember, we at Advanced Wildlife Management run a wildlife removal company, and charge for our services. If you are searching for help with a dog or cat issue, you need to call your local Warren County animal control or SPCA. They can assist you with problems such as a dangerous dog, stray cats, lost pets, etc. There is no free service in Warren County that provides assistance with wild animals. Snakes have the tendency to hide in piles of wood hence if you don�t want to have snakes in your garden ensure these few things. Firewood piles should be elevated from the ground. Store lumber and woodpiles at least two feet off the ground. Store lumber and woodpiles at least 2 feet off the ground. Remove weeds as well as piles of debris and any other areas where snakes can hide. No current news article at this time. If you need Lebanon raccoon removal, rat trapping, squirrel removal, or have any questions about a wildlife problem in Lebanon, please give Advanced Wildlife Management a call at 513-298-5400, and we will listen to your problem, give you a price quote, and schedule an appointment, usually same day or next day, to solve the problem.